As much as we’d like to eat at the table, it doesn’t always happen. Thankfully, the shape of Buddha Bowl’s Japanese-inspired designs are comfortable to hold, whether eating lunch at your desk or watching a movie on the couch. Founder Élan McPherson created her original Buddha Bowl for her arthritic grandmother. Its ergonomic curves make it easy to grip and hold onto without needing to set it on a table. 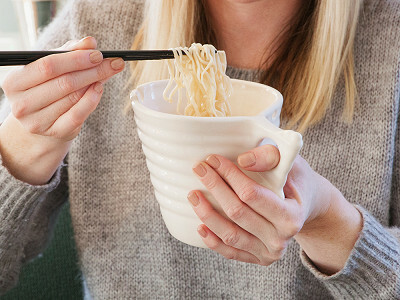 The Udon Noodle Bowl is a way to enjoy ramen and noodles—it even has slots to rest chopsticks between bites. Handmade in the USA and Canada, these over-sized bowls are dishwasher and microwave safe. 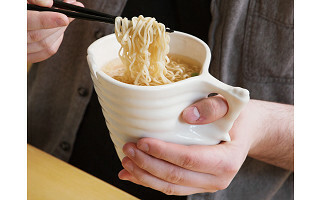 They’d even make a great gift for college students who eat in their dorms. And there’s no limit to what meals you can enjoy—salad, rice, mac & cheese, ice cream, or an XL cup of coffee in the morning. 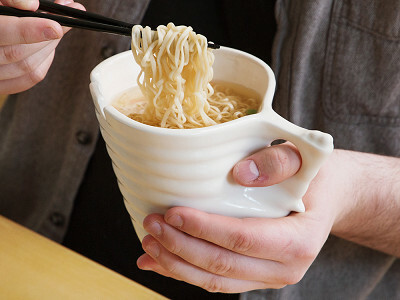 Whatever you use these bowls for, you’ll eat or drink comfortably. Hello everyone! I'm proud to introduce Buddha Bowl to The Grommet. I'd be happy to answer any questions you have! I would love to have two of these bowls for my husband and I, but unfortunately the price is a little to steep. I am sure my arthritic hands would love them. Very cool idea and good luck. Those lucky recipients will not be disappointed, Lisa. We had to pry them out of the hands of our Grommet talent holding them in the video. Thanks for the kind words! Great Idea, I love bowls with handles. Obvious question would be-are they temperature controlled? As shown, with the way the hands go under the bowl, do they get too hot and do you have to wait to handle them this way? How would I get the cozies? My sister has arthritic hands and she is temperature sensitive to either hot or cold sensitive. What colors are available? These would be great snack controll bowls as well! @Jennifer They never answered your question, I see. But for cozies, if you know someone who knows how to crochet, they would be easy to make. We don't sell the cozies on site and I'm not sure if Elan sells them, but such an item would bea hot commodity. Sandra, thats's a great idea to tap someone you know who has a skill for knitting or crocheting. Cool idea and i certainly know the struggle & enjoyment of 'couch dining.' Was curious if these are stackable. With limited space in our compact New England condo, i need to be aware of that as well. Is this true of the noodle bowl? How much liquid do these hold (in oz)? @Élan Thanks _ i just ordered 1 of each. I have looking for something like this for a while. Glad to hear it, Mike. 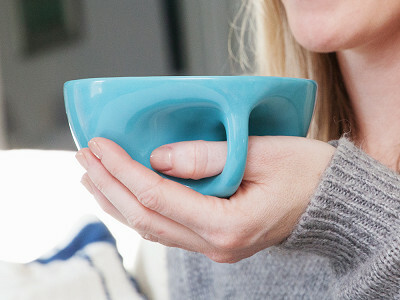 Your taste in ergonomic dishware is as great as your name. This might seem like a strange question- I seem to remember this same cup being used in a Starbucks commercial. Is this design something unique to your product, patented possibly or perhaps just strongly resembles a mid-century modern cup set? I do really like the look and function. Wow, love at first sight. Do you offer any kind of price break for buying multiples? Not at the moment, LeAnne, but if you buy two or pair one Buddha Bowl with just about any other Grommet you can receive free shipping. So much for Starbucks going green & American! Is Grommet going to be getting Baby Buddha Bowl and Buddha Cup? Hello, The name you have given to this item is extremely culturally insensitive and harbors on the border of racist. The "Buddha" bowl is a massive insult to the founder of one of the world's greatest religions, Buddhism. There is no relationship with this item and one of the greatest soul's ever to traverse on this planet. I am sure you would not call this bowl the "Jesus" bowl or heaven forbid the "Mohammed" bowl. I can't imagine the Buddha himself being upset about this. @Élan So call it the Jesus bowl. Thanks, Michelle, we can't either. Roger, Elan is not calling it that because as she described above, it was based on her readings of the Buddha begging bowl. Buddha isn't simply a synonym for other spiritual figures. @Mike @Élan It is duly noted that Élan's intention was not to insult or offend, however the alms bowl that Lord Buddha used can not be compared to this item. The history of the sanctified alms bowl is sacred in Buddhism and can not extend to everyday housewares. Furthermore, the use implications of the bowl used by Lord Buddha was not for ''relaxing'' or ''be one with the bowl'' as Élan noted. In the future the Grommet Team should be more vigilant and avoid sensitive names. Keep things PC. Your feedback is duly noted, Roger, thanks for taking the time to comment. @ROSEZETTA @ Mike It is best to avoid religious, cultural, or political names/concepts in commercial items. We understand it won't be for everyone, Rosezetta, thanks for the comment. @Roger, I do not usually chime in to such conversations, but as a practicing Buddhist of over 20 years, I could not resist. While I am sure you are coming from a place of well intentions, not as a troll, I cannot but giggle at your claims. First of all, you cannot claim racist as Buddhism is a religion not a race. Second the Buddhist himself says nothing is permanent, he holds nothing to be scared accept actions and words. Material objects meant nothing to him. We know this because one of the very tenants of Buddhism is to let go and reflect on the impermanence of everything around us. I doubt very much he would be offended by a bowl named after him. This is the kind of issue he would have avoided. I disagree with your assertion that the bowl the Buddha used was not for relaxing or being "one with". The Buddha would have his begging bowl filled then he would offer a blessing and be mindful of the food offering. In Buddhism it could be said, that all who practice should be one with their food as a way of reflection and to give thanks to all who made it possible for us to have food on our table. If you are truly a Buddhist you know all of this, and above all else should be the first to know how to let things go. If it makes someone feel good and possibly uplifted by owning a "Buddha" bowl, but you uncomfortable, you may want to meditate on why this is. Remember the Buddha wanted his words to remain after he was gone, not his name. Sure, that is all fine and dandy, but the point was not to attach a bowl to Lord Buddha. If I may, it sounds like Sari's point was that Buddha would let this go. "I am sure you are coming from a place of well intentions, not as a troll"
I'm not. I think that both his outrage and his claims are manufactured. I strongly suspect that his whole argument, especially "Keep things PC", is intended to mock the notion of PC. Hi Jim, I don't want to jump to conclusions about anyone's intentions, but as Elan mentions, this was not meant to offend anyone and pay homage to a respected spiritual figure. If you add boiling water to the bowl, is it thick enough that it doesn't get too hot to handle ? The mugs I use for my coffee get too hot to hold by the body when boiling water is in them. @Élan Perhaps the next version of the Budda Bowl could include an insulating layer? For coffee, I use the Bodum double layer glass mug - no problem with hot coffee, but too small for soup. Not a bad idea at all, Robert, it is certainly a possibility! Love the Buddha Bowls! Unfortunately, much like Betsy, I have Rheumatoid Arthritis and my hands cannot do a whole lot that they used to do... and my pocketbook cannot either.... the bowls are way too expensive for my retirement budget... but they sure look comfortable and like they would help... I eat daily from my recliner and this would be a god send! Good Luck! Hi Deborah, thank you for the kind words. As Elan mentioned above, it would be a great add to a birthday or holiday wish list as it will serve such a fantastic, practical purpose. @Élan Great work ! As an industrial designer, I have often felt that good design should consider all users. One of the design theories that worked well is that when we design with any disadvantage in mind, it worked really well for all. Our conventional design has the opposite approach. @Élan If you cannot afford this bowl, check online. 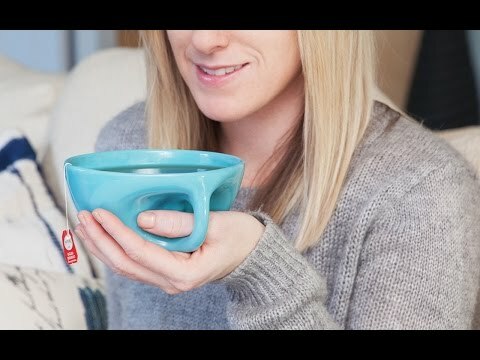 I have been seeing bowls of this design for years, it's not a new idea. @Janis oops! I meant do THE Buddha bowls stack well....! they usually add two packs and maybe some kimchee to them will that fit in the Buddha Bowl? What are the actual colors offered? The blue is not on the list. I presume tofu is the light colored cup. Is shiitake the black one? Hi, it's very possible the blue has sold out, but we will work to get it back in stock as soon as we can. If you select the color you want, the picture will come up so you can get a detailed look at it. But yes, your guesses are correct. This product caught my eye immediately. I love the design and the fact that it is American/Canadian made. My kids are love ramen and we love to play board games as a family so this would allow us to indulge both interests at the same time! I do have to note, however, that although it is clear that the product name was meant to be cute or catchy with no intention to offend, it does seem culturally insensitive, as @Roger has already noted. I am not remotely buddhist but I do think that another name would be more politically correct. @Elizabeth Check out what Sari wrote above. As a non-Buddhist I found his/her thoughts illuminating. @Jules Sari posted her comment 2 hours after I made mine but I am all caught up now. Thanks! Maybe we can all agree that this was a sensitive topic and move on. Like I said, I love the design and the domestic manufacture of the products. Yes, I think we can all agree to move on, Elizabeth. Thanks for the kind words! Glad to hear it's made in US. I don't trust Asian ceramics. Well worth the price. Looking forward to getting the cup/bowl. I realize these are made in the USA, but the price is insanely high. I purchase USA made products like these all the time for much less. It is a good product, but I will never purchase at that price. I think you would sell many more at reasonable prices. How much do the bowls hold and are they microwave safe? Just ordered the Bowl and not at all offended by the name. Please!! Look forward to receiving it as I think it's a great concept! I have college age grandchildren and I'm sure they will love it too. Hey I bought two of these from another source some years ago and I love them. I paid less (it was about 5 years ago), but I just really appreciate these for soups....really keeps cool on the handle. no complaints except the price is steep, but a good investment. @Élan - love the idea of your bowls -- it is a bit steep in price so will get it later. Just a thought-- make a cover for it. Any plans to add more colors? Like Green and Purple. I am left-handed. Can the bowls be held comfortably in either hand? This has been the image cover of my "wish list" board on Pinterest since I first got my Pinterest account 5 years ago. Unfortunately, the link was always broken and I had no idea what it was called or where to get it.. so it's just been living in limbo for years. So excited it's here on The Grommet finally!!! Thank you Elan! Hi everyone, as Gail said they take a few weeks to make so if they are backordered, you will receive them, it may just take a little longer to get to you. Everyone loved this product today! @Élan The "Shitake" is a DARK BROWN????? HAHAHAHAHAHAHAHAHA! Shitake is the name of a dark brown mushroom ... google it. How do you hold the bowl like that if it's HOT?? Hot food, hot drinks...?????? Hi Kathy, as Elan mentioned above, the clay material distributes heat nicely as opposed to the porcelain bowls you may be using. So it will not feel like it was just lit on fire when you first touch it.